The European Bee-eater is the only European representative of the Meropidae family consisting in total of 27 species. This is a migratory bird which arrives to Poland from Africa in spring and departures at the beginning of September. The birds live in colonies, they basically are monogamic and form couples for their whole lives. Pairs of birds usually arrive to the colony together. Right after the return they excavate the new nest burrows and repair the old ones. One pair can dig out multiple tunnels, however, most of them are not usually completed. This behavior is a defense mechanism which purpose is to mislead the potential predators. Only one burrow is used as a nest site. Clutches consist of 4 to 10 eggs (usually from 5 to 6 eggs) laid down in 24 to 48-hour intervals. 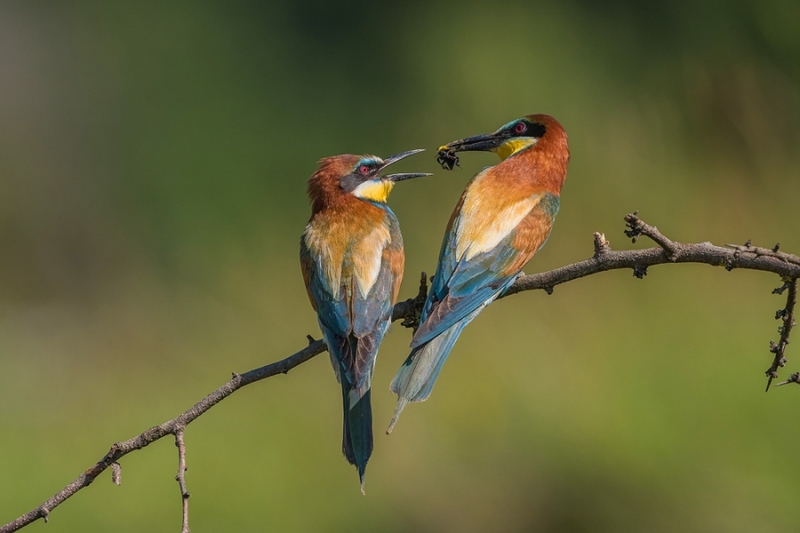 Only 20% of European Bee-eater pairs have helpers. This is one of the essential differences from other representatives of the Meropidae family. For instance, in the closely related White-fronted Bee-eater (Merops bullockoides), most of breeding pairs have got helpers. Moreover, in the mentioned species you can find behaviors aimed to force other birds to become helpers. For example some parents try to collapse the nest tunnels of their offspring from previous years. Therefore, the young ones are not able to start breeding and are obliged to help other pairs. 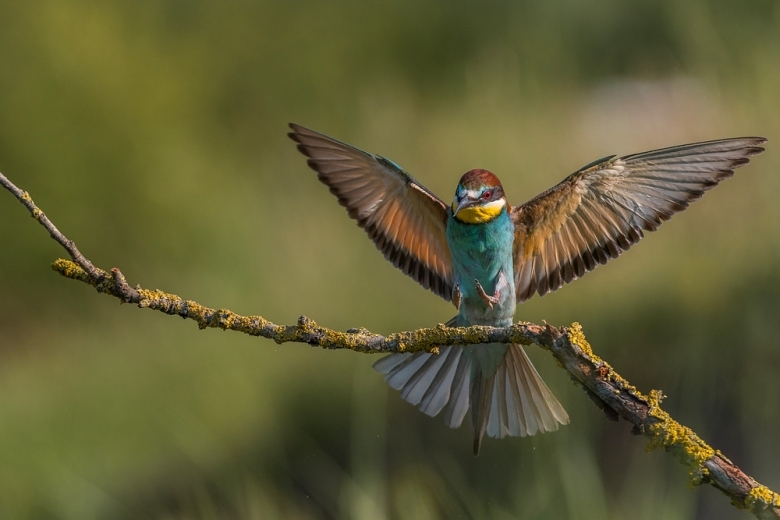 It is voluntary to become a helper in the European Bee-eaters. In the majority of situations a pair has one helper (75% of all cases), but examples of having 3 or 4 helpers are also known. A research carried out in the French colony of approximately 100 pairs showed that these are occasional cases (4% and 2% respectively). The same studies revealed that in almost 90% of situations helpers are males. What is interesting, statistically there are more males than females in the European Bee-eaters. In some way, this also exerts an impact on the number of male helpers. You also need to remember that males most frequently come back to the colony in which they were born. During withering bee-eaters from different colonies meet at gatherings. These are the places where birds often form pairs. At this point, it is worth recalling another important aspect of becoming a helper - family relationships. Helpers usually are related to one or both birds from the pair gaining assistance. Between the female that derives from another colony and other Bee-eaters in the nesting colony there can be no family bonds. This simple fact also affects the higher percentage of helpers which are males. One more interesting thing is worth mentioning here. Scientists wondered whether the distance between different nests can influence the possibility of becoming a helper or gaining one. Thanks to field observations it turned out that the nest distribution in the colony has no meaning at all and the kinship is really important. Another vital parameter is birds' age. Over 55% of helpers from the examined colony were one-year-old birds. Probably this is because their brood survival rate is much lower than in older birds, so it is not always worthwhile to breed in the first year of life. The next group of potential helpers are birds that have lost their brood. Field studies show that the later the brood loss occurred, the more probable was to become a helper and not to repeat breeding. This is not a rule of thumb for all birds that have lost the brood and have not repeated their breeding attempts. In these cases, almost 45% of males and 87% of females do not become helpers. Finally, the other but less numerous group of potential helpers can be distinguished. These are the birds that had breeding success in the last season, but hasn't made an attempt to breed in the present season. The scope of duties of a helper is quite varied. They can take part in incubation, rearing and feeding of the chicks. There are no clearly defined rules stating when the helper appears and how long it assists the breeding pair. There are known cases of help gained in the course of the whole breeding season. However, there are also cases of short-term help beginning at the end of incubation and finishing at the start of feeding. The behavior of a helper and parents are synchronized. It can be seen best just before leaving the nest by the chicks. In this period both parents and the helper temporary stop feeding the chicks and resume the feeding after all young birds fly out of the nest. Helpers usually do not participate in excavating the burrows. It is worth considering why helpers assist at all. At the first glance, this behavior may seem to decrease the chances of sustaining their own DNA lineup. Moreover, it is interesting that an average helper is a sexually mature bird. What makes these birds to voluntary resign from breeding and having offspring? What are the benefits of being a helper? We need to discuss two topics to understand better the benefits of being a helper. The first point is the inheritance of genes by the offspring. Similarly, as it is in humans, every bird parent passes to its offspring 50% of its genes. Therefore, the direct siblings share 50% of genes. The siblings having the only one mutual parent share 25% of genes, the closest cousins share only 12,5% of genes and so on. The second important topic is the Kin Selection strategy. It is all about favoring breeding success of related birds, even at the cost of the individual bird breeding success. The Kin Selection is not a common thing in birds and it requires specific conditions to be met. They are specified by the Hamilton’s Rule. I will explain this rule making some simplifications. Every bird must bear costs of reproduction. Kin Selection is possible when these costs are greater than a sum of two other factors. The first one is the cost of helping to be borne by helping bird. The second factor is the probability that the breeding success of aided bird will substantially contribute to sustain at least a part of genes of helping bird. Well, how all the above mentioned factors correspond to having helpers by Bee-eaters? Let’s explain that using an example of birds losing its brood. As we already now, the later this tragedy happens, the lower are the chances of repeating the breeding. On the other hand, the probability of becoming a helper is rising. This is a typical symptom of the Ken Selection, because repeating the breeding attempts means additional effort for both birds from the pair. Late breading attempts also drastically decrease the probability of breeding success. In extreme situations, it can also mean worse physical conditions of the birds and greater mortality during migration. However, helping the related pair can significantly enhance the likelihood of sustaining the bird’s own genetic lineup. Helping the unrelated birds is unjustified. It is worth noticing, that this strategy gives the Bee-eater helpers mainly indirect benefits (sustaining genetic lineup) and long-term benefits (gaining help at later stages of their lives). Only aided birds gain direct and instant benefits from helpers. We know that pairs with helpers neither start breeding earlier nor lay more eggs. This can suggest, that lack of helpers do not affect the breeding condition of birds in the pair. However, it affects the physical condition of the chicks. 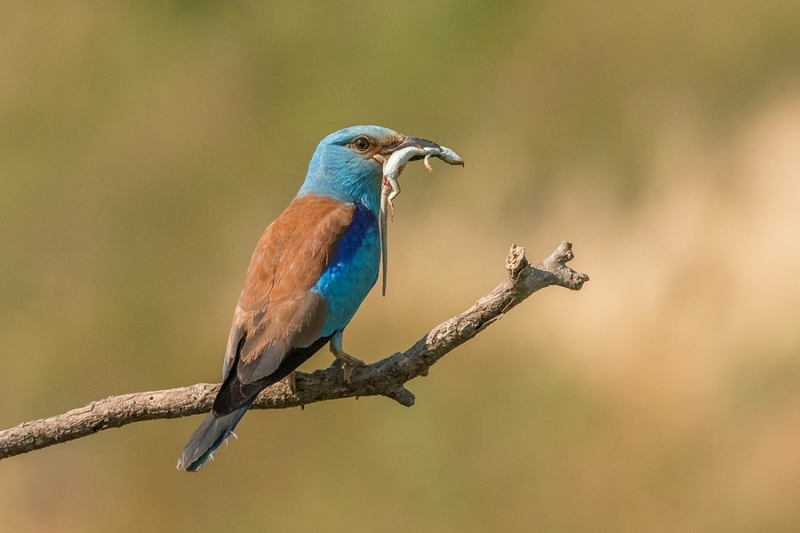 The broods of Bee-eaters with helpers postpone the point when the starvation may occur. Just after hatching, the brood of 4 to 5 chicks will be fed on average 12 times per hour. The brood of 6 chicks at the age of 1 to 2 weeks is fed 35 – 45 times per hour. Once a helper appears, this frequency rises and can exceed 50 feeds per hour with the record of 175 times per hour! There is one more advantage of gaining a helper. The number of feeds performed by a male Bee-eater is lower than when compared to a pair without a helper. It does not affect the number of feeds performed by a female. The gained help causes that the number of chicks which survive to fledging is almost two times bigger. At the moment of leaving the nest, chicks from pairs with helpers are larger than birds from other pairs. All these factors increase the survival probability in both chicks and parents, what causes afterwards that more birds from assisted families return next season to the breeding colony. In territorial Bee-eaters (the European Bee-eater is not one of them) one more group of benefits stands out. Birds becoming helpers increase their chances of gaining their own territory or breeding place where feeding and breeding grounds are of limited availability. This can happen when one of birds gaining help suddenly dies. This also gives the additional chance of finding a mate. The topic of helpers in Bee-eaters is very interesting. Fortunately, in Europe there are many places where you can observe Bee-eaters. During such meetings, it is good to be aware of their complex social life which can be admired. These observations will boost the birdwatcher’s experiences caused by colorful feathers and pleasant voices of Bee-eaters.